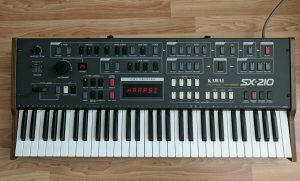 “The Kawai SX-210 is a very rare synth. It’s an 8 voice poly synth with 4 poly stack mode as well as mono mode and chord mode. Built in chorus gives you the ability to hit those Juno sounds as well as polysix/MonoPoly sounds. It’s got Sub Osc, PWM, LFO routing/trigger and more. It’s a very capable and great sounding synth. It has a very large patch name display which is unique as it lets you write words for patch names rather than just a 2 or 3 digit number. This is probably the best condition you’ll ever find one of these in. All the keys and buttons feel right and the overall appearance of the unit is in excellent condition. Old battery has been removed and the last custom CPU repair kit from Portugal is included with it. “Rare analog poly synth manufactured in 1983. No midi because this keyboard came out right before midi was available. Great sounding DCOs, very versatile synth with sub oscillator, poly 8, poly 4, or mono. All functions work EXCEPT some of the preset buttons. I repaired the rotary controller which now works perfectly. Some preset buttons don’t work or make an odd noise when pushed. Output is noisy, but usually not noticeable when notes are played. This unit is sold for parts or repair, and sold as is! “Hi, I’m selling my vintage Kawai sx-210 – it’s in perfect playing order with the original patch memory inside. “VINTAGE KAWAI SX 210 KEYBOARD. FOR REPAIR OR PARTS ONLY! IT POWERS UP. BUT NO SOUND. 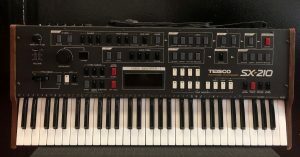 “Up for sale is super rare Teisco SX-210 Vintage Analog Synthesizer (also known to be manufactured under the name of Kawai). The unit appears to be fully functional, all the keys and buttons and knobs working fine, as well as Writing / Editing new patch programs. Cosmetically the unit is in very nice condition as you can see. There maybe some minor wear and marks here and there, with slight damage on the woodend corners as shown, but nothing major at all and obviously have been looked after very well. I’m including plenty of pictures so you can see exactly how it looks. “This unit is being sold as is…. ich versteigere schweren Herzens diesen wohl meistgesuchten Synthesizer in einem Topzustand, in dem er Höchstwahrscheinlich nicht noch einmal so zu bekommen ist. Ich besitze Ihn seit 1989 und habe lediglich ein wenig damit rumgespielt.1990 habe ich Ihn dann gut Verpackt und auf dem Dachboden verstaut. 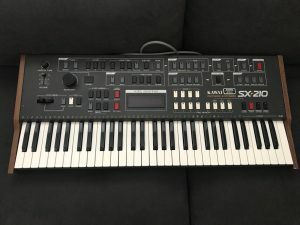 Habe Ihn vor ein paar Tagen ausgegraben und angeschlossen.Anfangs reagierten die Parameterknöpfe etwas schwerfällig aber nach kurzer Zeit war alles ok.
“Up for auction is a vintage Kawai SX-210 synthesizer, and a soft shuttle gig case. Believe it or not, I am the original owner! My parents bought this for me in my early teens to keep me interested in piano lessons. It worked. This particular unit was put in my parents basement when I entered the military in 1988, and hasn’t seen any use since then. I turned it on and all of the memory positions were corrupted. I entered a few patches from the owner’s manual (available here: http://www.kawaius-tsd.com/OM/K_SYNTH/SX210.pdf). and it seemed to work. The shuttle gig case foam is shedding like crazy from age. I will ship the sx-210 in the case, but will wrap it first to ensure no foam gets into the synth. Seems like there is a key randomly pressed when playing with certain programmed patches. May be part of the patch, but I’ve long since forgotten how to program this unit. Othwerise, my daughters and I had fun dusting it off and playing with it for a few hours.” Auction ended. Click here to browse on eBay. “In good working condition — all keys work fine, all switches work. Power cable in good condition. ” Auction ended. Click here to browse on eBay. “Your biddding on a Rare Vintage Kawai SX-210 Synthesizer. 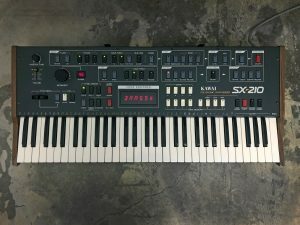 This rare vintage Kawai SX-210 synthesizer is in great condition. Easily rated an 8.0 out of 10. The SX-210 is a great sounding DCO based synthesizer with 8 voices ( 1 DCQ and 1 sub oscillator per voice ) analog filters, and envelopes ( 1 of each per voice ). The oscillator has 3 waveforms: SUB-OSC, PWM control, and a noise generator. The LFO can modulate: DCO, VCF, and VCA all at the same time. It is also one of the few synthesizers with both glissando and portamento. Please note – 1 key does not work and there are some nicks on the woodgrain. (see pics) ” Auction ended. Click here to browse on eBay. 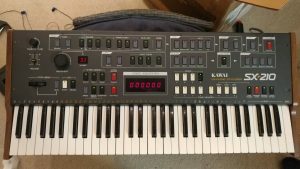 “This rare vintage Kawai SX-210 synthesizer is in great condition and comes with a manual. Easily rated an 8.0 out of 10. The SX-210 is a great sounding DCO based synthesizer with 8 voices ( 1 DCQ and 1 sub oscillator per voice ) analog filters, and envelopes ( 1 of each per voice ). The oscillator has 3 waveforms: SUB-OSC, PWM control, and a noise generator. The LFO can modulate: DCO, VCF, and VCA all at the same time. It is also one of the few synthesizers with both glissando and portamento.” Auction ended. Click here to browse on eBay.